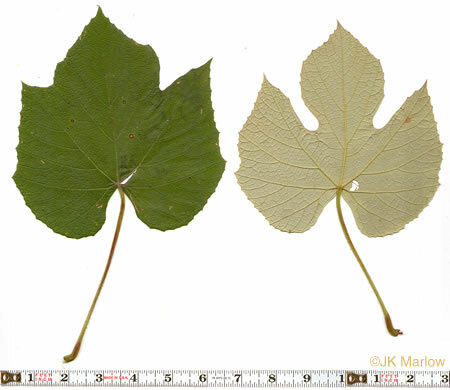 Your search found 26 image(s) of leaves of grape-like species. 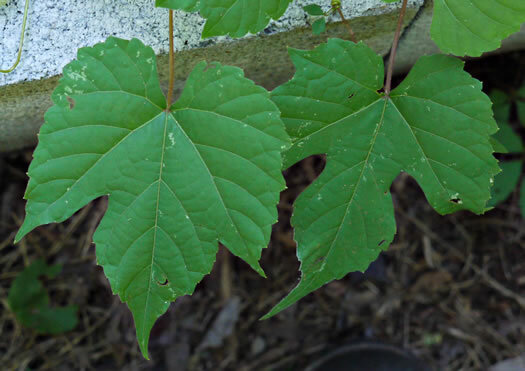 Leaves 2 to 4" long with large and distinct (dentate) teeth, per Woody Plants of the Blue Ridge. 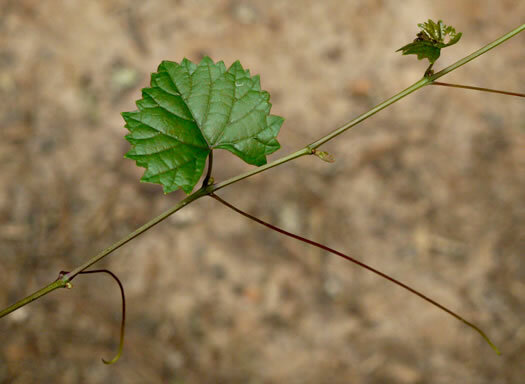 Tendrils not forked (whereas those of other grapes are usually forked), per Woody Plants of the Southeastern US: A Winter Guide. 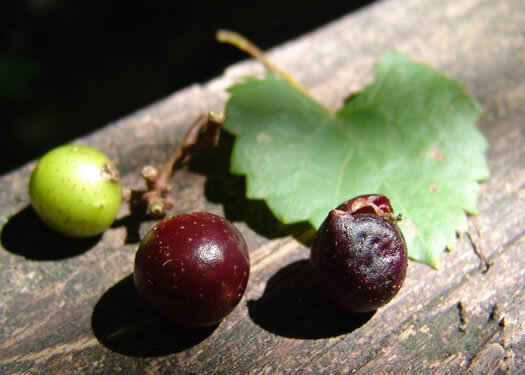 Fruit green turning red to purple to black, occ bronze; tan spots when ripe, per Forest Plants of the Southeast and Their Wildlife Uses. 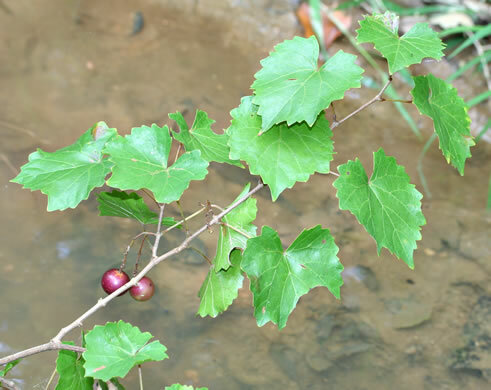 The berries, thick-skinned grapes, in clusters of 1-few, per Forest Plants of the Southeast and Their Wildlife Uses. 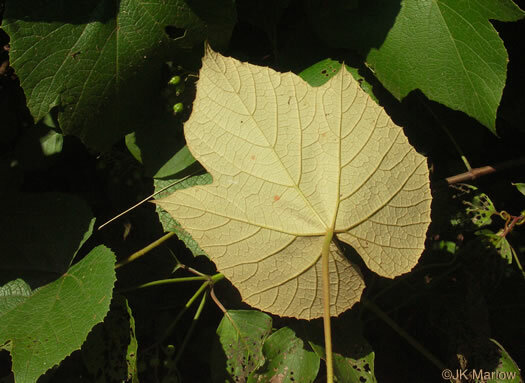 A dense matting of rusty, tawny to whitish, cobwebby hairs beneath, per Native Shrubs and Woody Vines of the Southeast. 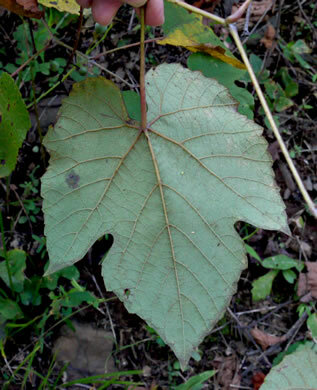 Leaves felty below, brownish hairs mostly concealing the leaf surface, per Woody Plants of the Blue Ridge. 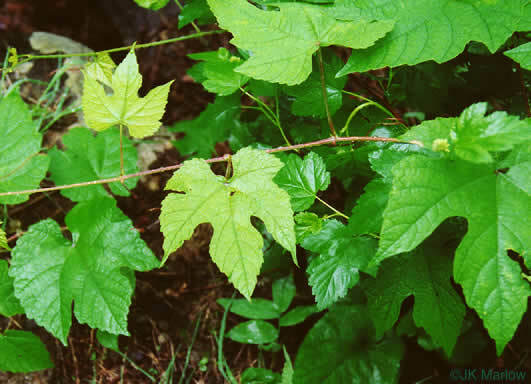 Twigs bear tendrils at about every node, per Woody Plants of the Blue Ridge. 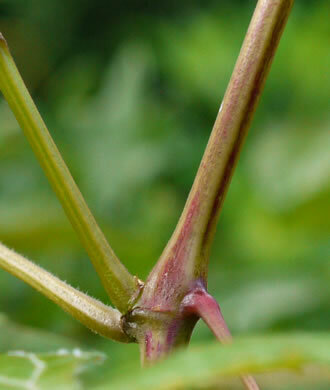 Marginal teeth convex on each side, per Woody Plants of the Blue Ridge. 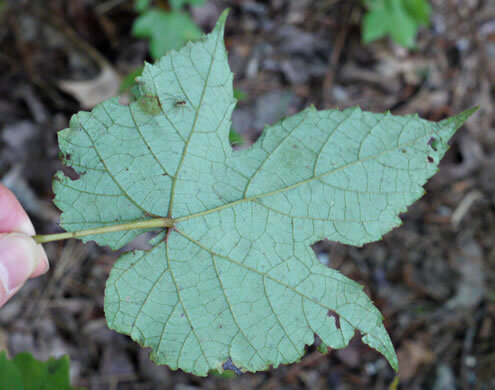 Leaves green below, glabrous or slightly hairy on the veins, per Woody Plants of the Blue Ridge. 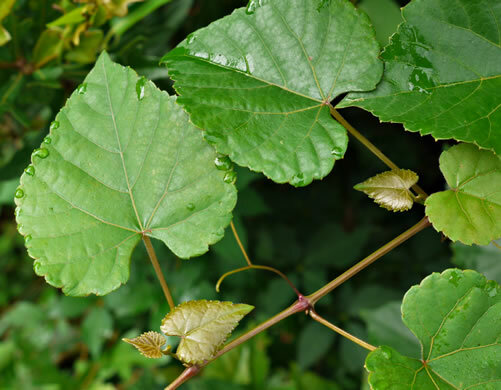 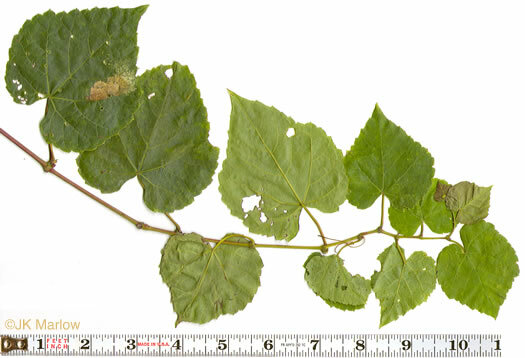 Blades cordiform (deeply lobed leaves found only on ground shoots), per Upper Canopy Collection and Identification of Grape Vines (Vitis) from Selected Forests in the SE US (Everhart, 2010). 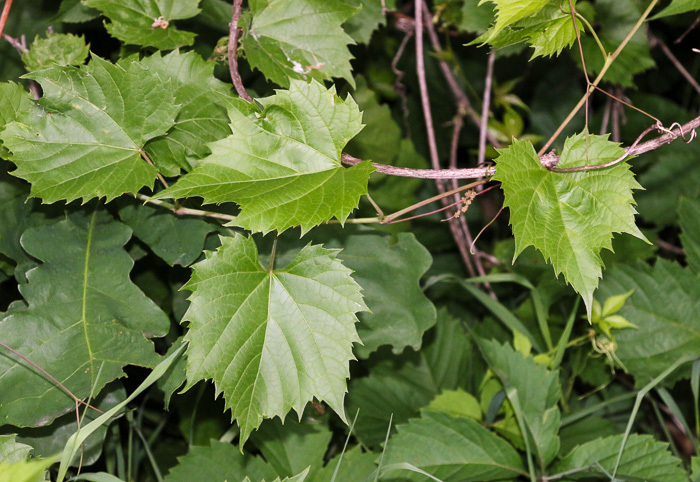 Twigs with tendril absent at least every third leaf, per Woody Plants of the Blue Ridge. 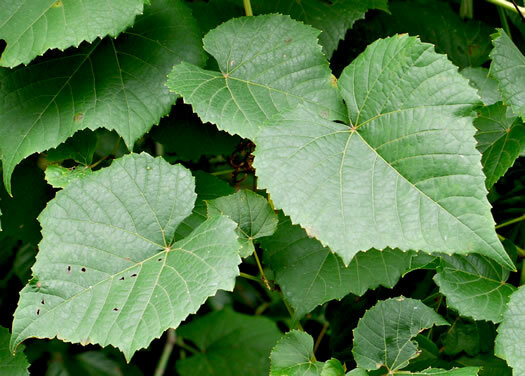 Leaves glabrous to very slightly arachnoid-pubescent beneath, per Weakley's Flora. 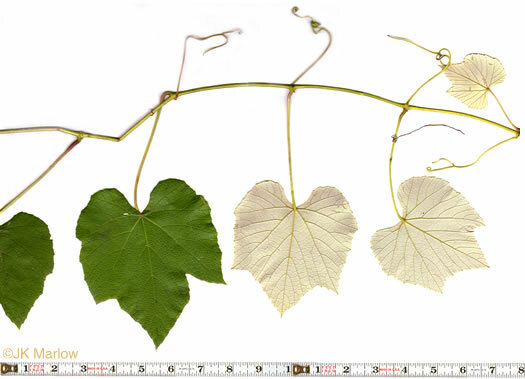 Branchlets of the season angled; nodes usually banded with red pigmentation, per Weakley's Flora. 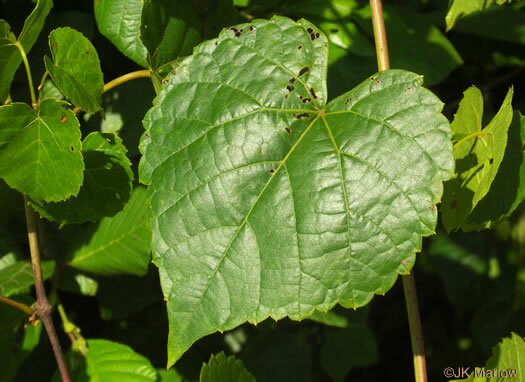 Leaves often deeply lobed, per Weakley's Flora. 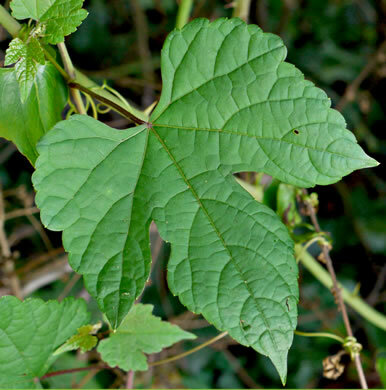 Opposite every 3rd leaf there is neither tendril nor flower cluster, per Newcomb's Wildflower Guide. 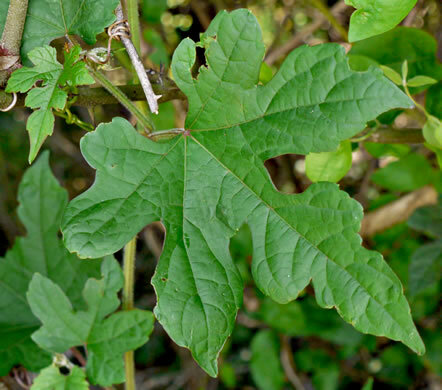 Leaves cordate to orbicular, unlobed or 3-5 lobes, dentate to crenate, per Forest Plants of the Southeast and Their Wildlife Uses. 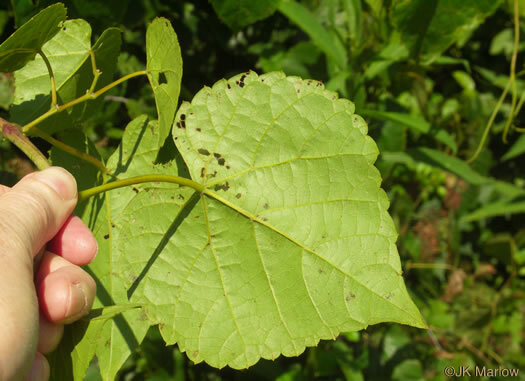 Leaf teeth are ciliate on the margin, acute or convex on only one side, per Woody Plants of the Blue Ridge. 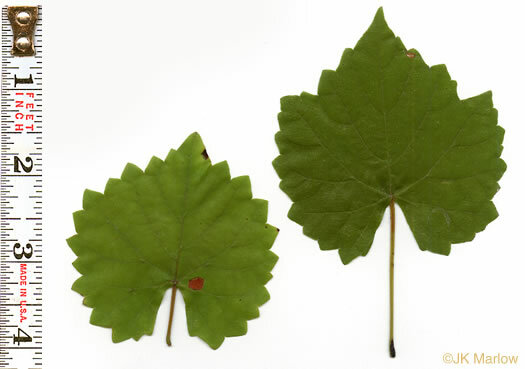 It is difficult to distinguish from a native grape based on leaf shape alone. 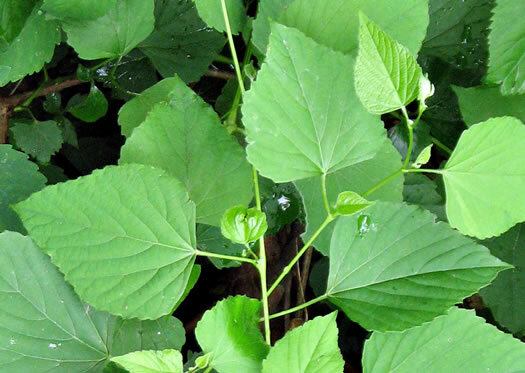 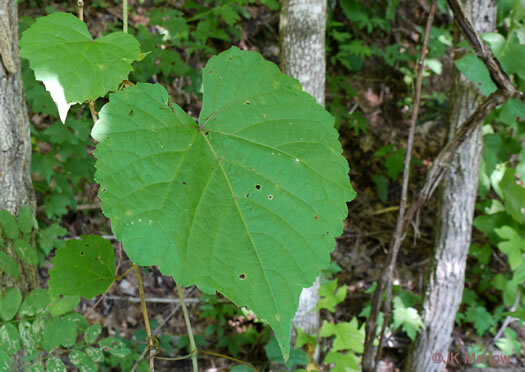 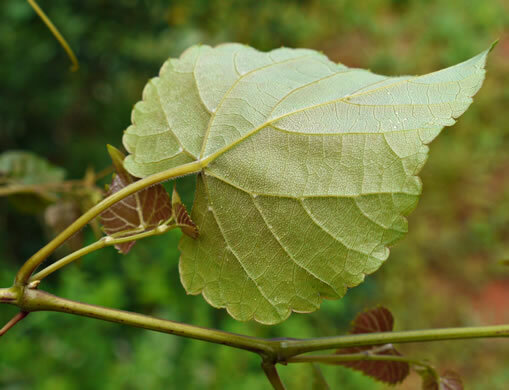 Leaves may have multiple incised, rounded to scalloped lobes, per A Field Guide for the Identification of Invasive Plants in Southern Forests. 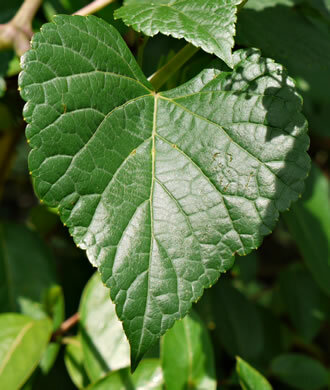 Leaves heart-shaped in outline but variable in form, per A Field Guide for the Identification of Invasive Plants in Southern Forests. 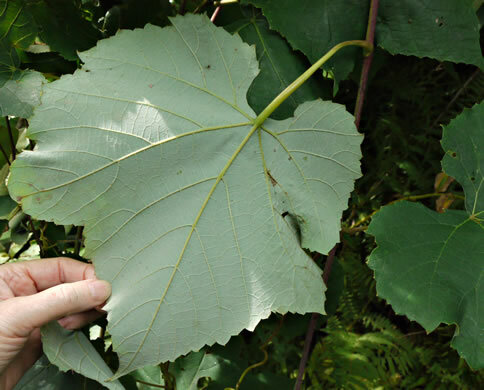 Leaves simple and palmately veined (grape-like), 3(-5) lobed, per Weakley's Flora. 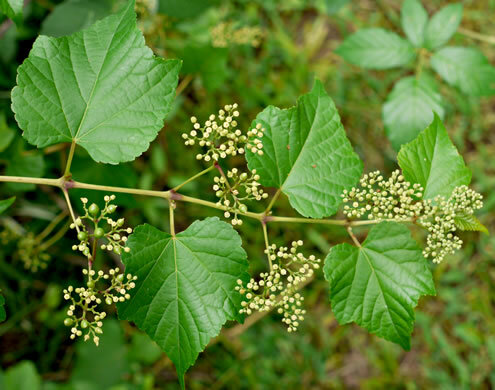 Leaves simple, grape-like, not lobed, to 12cm long and 9cm wide, per Weakley's Flora.